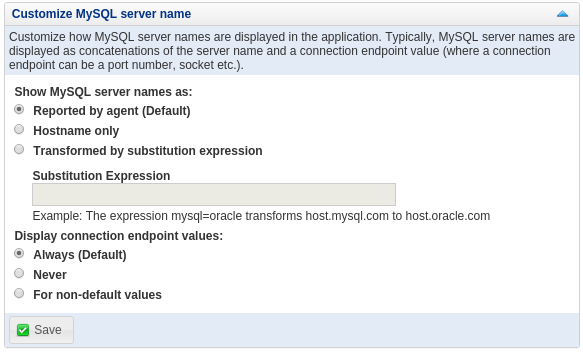 This section describes how to configure the display names of your monitored MySQL hosts. Reported by Agent (default): the MySQL server names are displayed exactly as reported by the monitoring agent. Hostname only: only the host name is displayed, omitting suffixes such as companyname.com. Transformed by substitution expression: enables the Substitution Expression field. This enables you to replace some, or all, of the hostname with custom values. Enables you to substitute your hostnames with custom values. These substitutions can be simple substitutions, or more complex regular expressions. The substitution expression is a name-value pair, with the original value, or regular expression on the left, and the substitution value on the right. You can include multiple, comma-separated, substitutions. More complex substitutions are possible by using a regular expression. For more information on the syntax used in these regular expressions, see Regular Expression Constructs. Always (default): endpoint values are always displayed. Never: endpoint values are never displayed. For non-default values: endpoint values are displayed only if they differ from 3306 and /tmp/mysql.sock.